Power management reports use average data for different types of computers (desktop, notebook, or laptop). When you generate a report for a group of computers, the computers in that group are matched with the average wattage data for corresponding computer types. Data is therefore based on an average but not on specific usage. An XML file contains this average data. If you have collected historical data from your managed devices, you can generate a new XML file that uses data from your own managed devices rather than from averages. This XML file replaces the default file and thus reflects the power usage in your organization and provides more accurate savings reports. On the toolbar, click the Customize button ( ) and select Replace client usage assumptions with historical data. Select the device groups or queries that you want to use to calculate data. Select the time period from which you want to calculate new data. You can choose the latest week or specify a period of time. A new XML file is created. The data in this file will be used in savings report calculations. 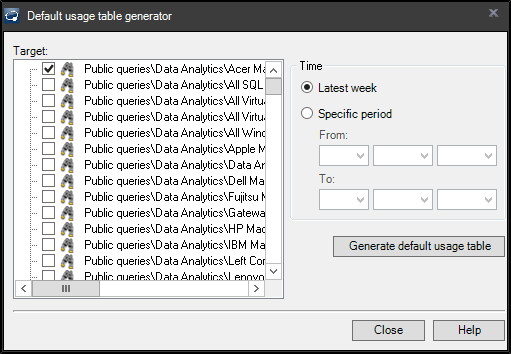 NOTE: To generate a new XML file, you must have collected historical data from managed devices for at least the time period that you select in this dialog box. If there is not sufficient historical data, you won't be able to generate a new XML file.